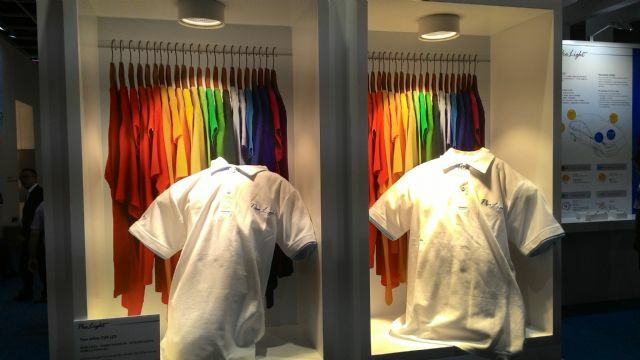 ProLight Opto Technology Co., Ltd.
ProLight's unique phosphor formula in its high CRI LED packages helps achieve vivid effect on merchandises like apparels. Among the striking LED packages that ProLight Opto Technology Co., Ltd., an LED package veteran, displayed at the 2015 Autumn edition of the Hong Kong International Lighting Fair during its four-day run beginning October 27 included the flip chip on board (COB) packages, the packages for projectors, and the packages boasting high color rendering index (CRI) with unique phosphor formula. The flip COB packages are built on the technology that is borrowed from silicon-chip manufacturing. The technology stresses attaching LED dies to the substrate using eutectic soldering instead of wire bonds, thereby minimizing the possibility of the dies breaking due to thermal deforming of the substrate to optimize thermal dissipation between the dies and substrates. The packages even deliver longer lifetime at high power and wattage. Also, the flip packaging technology increases the COB packages' droop effect and lumen efficiency at low voltage, high current. The company's projector LED packages, incorporating red, green and blue LED chips, are developed to replace incandescent bulb as backlight inside projectors, allowing projector makers to build machines that are smaller and are integrated with LED backlight that have longer lifespan. The packages use 7W LEDs to generate 750lm of light. ProLight's high CRI LEDs use unique phosphor formula, enabling light emitted with enhanced color signature to achieve more vivid effect on objects. The packages are mostly built into commercial lights. Shanghai Cooled Electrics Co., Ltd., an LED light engine maker, has chosen ProLight as its supplier of high-voltage AC LEDs based on the Taiwanese manufacturer's expertise in building high-power LED dies into compact packages, measuring 40mm x 50mm and 35mm x 35mm. Also, ProLight's hemispherical high-power packages are especially notable for even light distribution. Founded in 2004, ProLight makes LEDs that are mostly used in solid-state lighting, backlight for midsize and large-size TFT LCD panels, flashlights for high-definition digital cameras and cell phones, handheld lights, high-resolution billboard displays, automotive lighting, and special-purpose lighting.